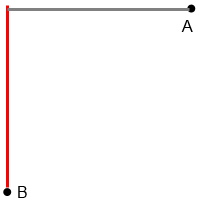 The Pythagorean theorem has already been proved and it is a basic fact of math. It always works, and there are proofs of it. But I have found a problem. Say you want to get from point A to point B. Here is a way to do it, where red is vertical movement and grey is horizontal movement. 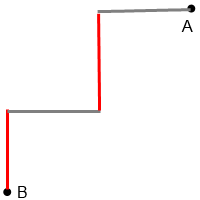 And if you continue forever, the path will become diagonal. I know the Pythagorean theorem is true and proven, so what is wrong with this series of steps that I went through? By splitting the path you have essentially created lots of little triangles. You still need to apply Pythagoras' theorem to each one. If you do, then you will get the correct answer. The problem here is that the limit of the lengths is not the length of the limit. One has assumed that the sequence of lengths $x+y,x+y,x+y,\ldots$ converges to the length of the hypotenuse in the fake proof. Not the answer you're looking for? 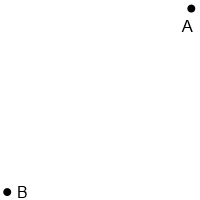 Browse other questions tagged geometry triangles fake-proofs or ask your own question. 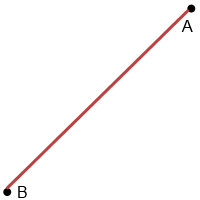 How is it that this shape can converge to what looks like a triangle but has a different perimeter? 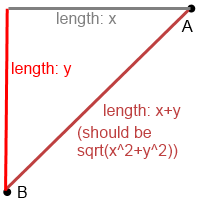 Why are two completely independent variables still linked through the Pythagorean theorem? Why does the Pythagorean Theorem not work on this problem in the way that I used it?